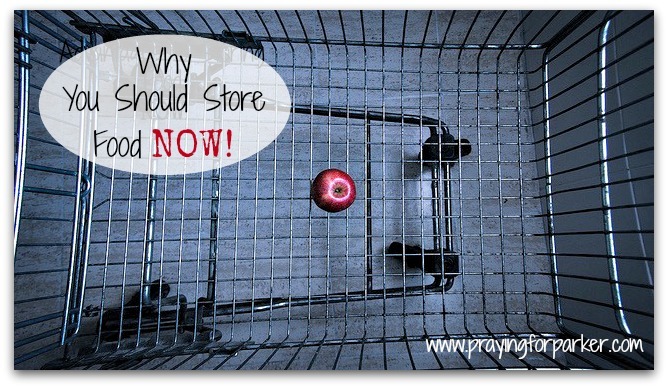 You are here: Home / Food Storage / Why You Should Store Food NOW. Why You Should Store Food NOW. I’ve had people ask me why they should store food now rather than waiting to see if a crisis event takes place. Many would rather have their money earning interest in a bank so that if the s-ever does hit the fan, they have the finances to deal with their new normal. Having a stash of cash is important in an emergency situation. However, I believe that the time to get your tangibles is before the crisis, not after. There really are times when food is more valuable than money. * You can’t eat money. In times of crisis, store shelves will be wiped out in the blink of an eye. It won’t matter how much money you have on hand if there’s nothing around to purchase. * Items from your food storage will be highly valued barter items. Cash stands a huge chance of being devalued to the point of worthlessness. * Food prices are only going up. And up. And after that, they’ll go up some more. When you store food now, using a variety of techniques, it’s like money in the bank that is actually earning interest in the form of being exempt from rising food costs. * A one dollar package of humble garden seeds will increase the value of that buck 20x in the form of fresh veggies, compared to vegetables purchased at a grocery store. Where else can you increase the value of that greenback in such a dramatic way within one mere growing season? Nobody can control the economy. But we can control how it affects our lives. Storing food is one way to prepare for what ever uncertainties the future may hold. Do you store food in case of emergency?